I have a weird relationship with baked goods. In the past I have eaten too many of them, which then displaced other nourishing foods like vegetables and proteins. So then I went the other direction and completely cut out all grains. I could probably live with this if it weren’t for another odd relationship that I have with butter. Butter is one of the many reasons I get out of bed with a smile on my face in the morning. It makes an appearance at almost every meal here. It is one of the driving forces behind my desire for a dairy animal. And it may or may not have given me an easy childbirth this last time around. Say what? I know it sounds weird, and it might just be a coincidence, but for the last few weeks before our daughter was born this past February I ate at least 2-3 pieces of bread per day with grass-fed butter slices so thick you could easily have mistaken them for cheese. And then I had a quick, easy (as easy as childbirth gets) four hour labor with the quickest recovery I’ve seen after three children. Butter miracles aside, if I go a few days without good butter I start to crave anything and everything that I could spread butter on. Toast, bagels, bread, etc. But wheat is no friend of mine, especially when it hasn’t been soured or soaked. 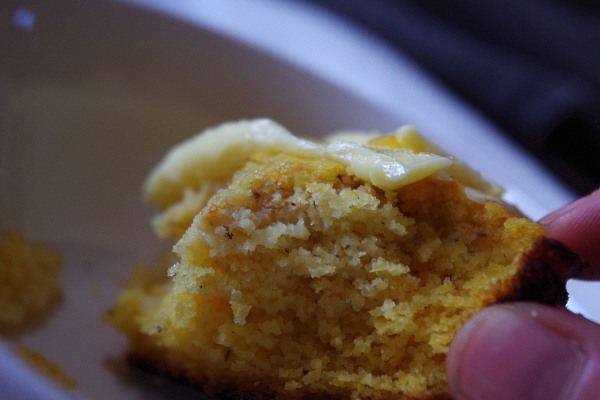 So I made this 100% corn cornmeal bread the other day. It wasn’t soaked, but it was super simple and delicious smeared generously with pastured butter and honey and served alongside scrambled eggs for breakfast. It left me feeling light yet satisfied in a way that wheat-containing baked goods just never seem to do. And did I mention that corn and butter are best buddies? Preheat oven to 450 degrees. Grease a 10″ cast iron skillet or an 8×8″ pan. In a small bowl combine cornmeal, baking powder, and salt and whisk well with a fork. In a medium sized bowl beat eggs and mix in honey, milk, and melted butter. Pour the dry ingredients into the wet and mix until just combined. Pour batter into prepared pan and place in oven. Bake 20-25 minutes or until a knife or toothpick comes out clean when inserted into center of the bread. Allow to cool before cutting. Serve with lots of butter (obviously). Shannon is a lover of real food - the kind that you can grow in your own backyard - and the nourishment it provides a family. MOREShe's a wife and mother to three, a cook and fermented foods enthusiast, a chicken wrangler and a seed planter, a helpmeet and a homemaker, an off-grid dweller and a homesteader. When she can she enjoys writing about it all here at the Plan to Eat blog, and on her sustainable living blog Nourishing Days. Hi, I have family member who is really allergic to wheat flour recently, found this recipe today, decided to try. I put scallion instead of honey, add garlic powder, parparika to make it savory. Bake it in steam bake oven for 25 minutes, looks delicious, cannot wait to try it. Thank you. First time I’ve found a recipe for 100% cornmeal bread and have all ingredients ready but, although I’m an expierenced cook, I’m struggling with the apparent mixing of measurement – do you have it available in something precise like grams or even ounces. Egg I’m happy to guess as medium. but measuring butter in different ways depending on whether it’s melted or not is ‘tad’ awkrd! 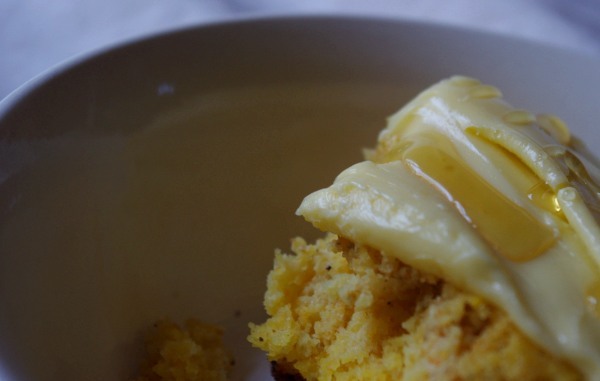 Thanks for this cornbread recipe with no wheat flour. I am going to try it today. I would like to know, I am using masa flour, and it doesn’t cooked. what is the reason ?